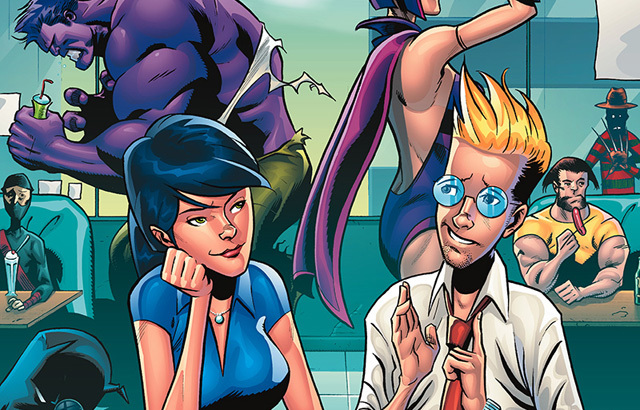 GRAVEYARD ORBIT #1 Review | Warped Factor - Words in the Key of Geek. When that’s the way a new comic starts, opening text over a rather typically superhero pose, you’re not exactly sure what to expect, but you know it’s going to be a bit of a wild ride. Those of us who still have to work in an office when what we really want is to show that world that we are in fact (and I now quote both Tony Fyler and my beloved husband Jonathan) Queen of the Geeks, know that survival in the nine to five is dependent on the ability to imagine something better, and that is what John-Paul Kamath gives us with Graveyard Orbit. We start with Edgar Tibbs in an interview. The interview tag team turn, in his mind, into alien villains - fairly sure I’ve been interviewed by a few of these over the years too. The post-interview examination with various heroes (Thor, Batman - why do I hear that in a Wolowitz impression? - and Wolverine), is illuminating, then we segue easily into pulling the beautiful waitress, a la Bond. 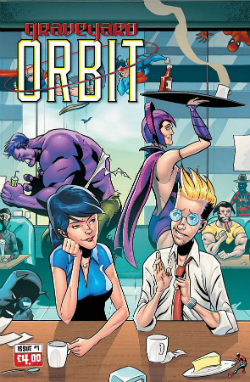 Graveyard Orbit is a bit Walter Mitty, a bit this, a bit that, and overall really rather original. It absolutely encapsulates something I know and understand intimately - being a hero in your own head - Queen of the Geeks - something that the grey world of the office job feels like it’s going suffocate at times. Particularly this week, which has been tough and is probably why I finally put other projects aside to read this comic, something I bought at the London Film and Comic Con three months ago. Pathos, keen pen and pencil work, observations and humour. This incredible independent comic is for those who habitually mix the real and the imagination - in other words pretty much every comic reader out there. I love it, five out of five, and I can’t wait to read the next issue, which I have but it’s too late at night to read now.